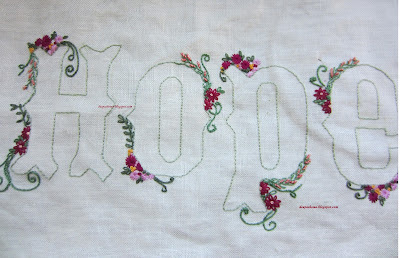 Embroidery in progress - "Hope"
How have you all been? Here in Erlangen, all are waiting for the Erlangen Bergkirchweih Carnival to start. This is a 12 day folk carnival in which everyone drinks buckets of beer. Not sure what's the big deal about it though. Everyone here seems to drink buckets of beer otherwise also. My latest embroidery is progressing well. Last week I added a few more small flower bunches to my "hope". 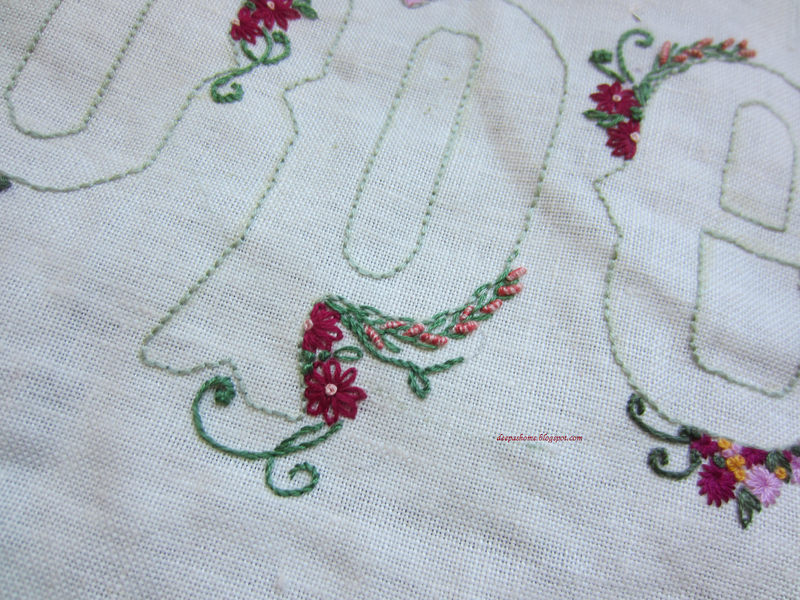 I added a bunch of eyelet stitch inspired flowers to all the letters. 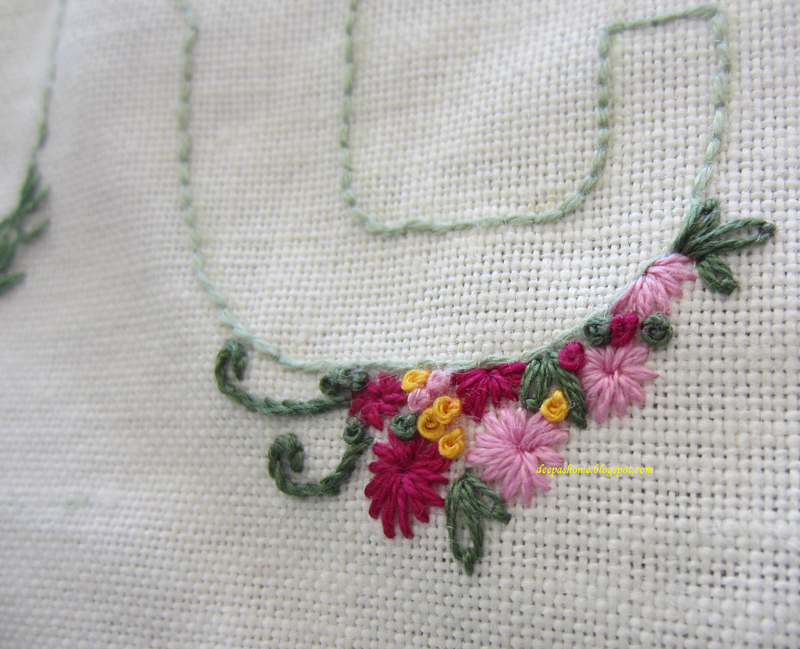 Well, not exactly eyelet stitch,but straight stitch flowers converging at the center, with a dash of french knots. So this is how it looks right now. How would you continue from this stage? A few more bunches and a lot of greens? It looks lovely so far, Deepa! I like the way this is going. A little more thinking and listening to it, and I am sure you will see the way forward.. I've got my summer clothes down from the loft, optimist that I am! I like the letters like they are - the only thing I might do is 'whip' the straight stitches with either the same thread or something metallic perhaps. Just my thought! It is already looking so elegantly beautiful ! Fill the centres with at least one bunch of flowers along the inside, and fill the rest with greens. For the outside, you can still add a few more flowers either in bunches or a few strewn about. I would think that one can start filling with greens, lots of curlicues/tendrils; this will give you an idea of where more flowers can or need to be added. And where some more leaves can add density. this is coming along so beautifully, not sure what to advise but maybe where the letters are so close together just have the greenery as I feel if you do lots of flowers they will more or less join together and then maybe the letter shape will disappear, I personally would leave inside the letters blank. I made my initial like this years ago wonder where it is now and also did Helen`s name. I love how this is looking--so beautiful and elegant. The flowers are great, and I especially like the two-thread bullions. 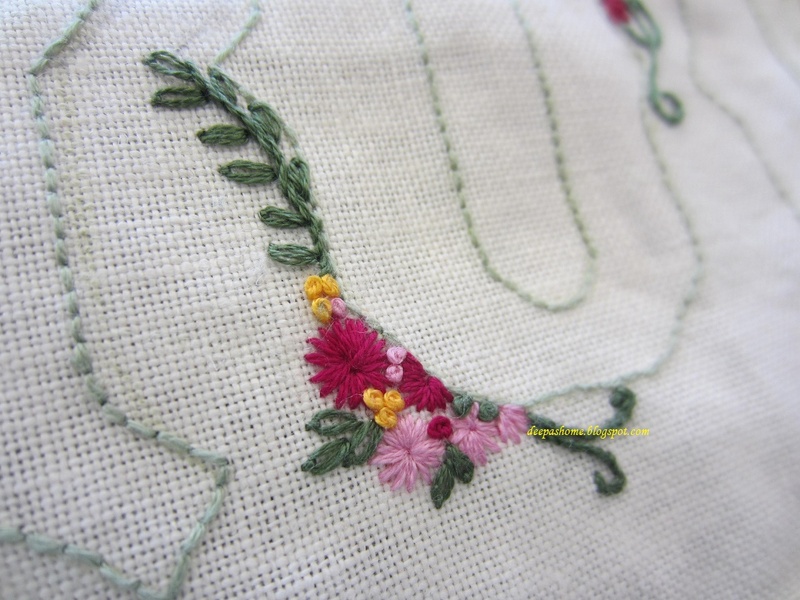 My feeling is that too much frilly greenery and flowers would not allow the completed stitching to stand out as it now does. 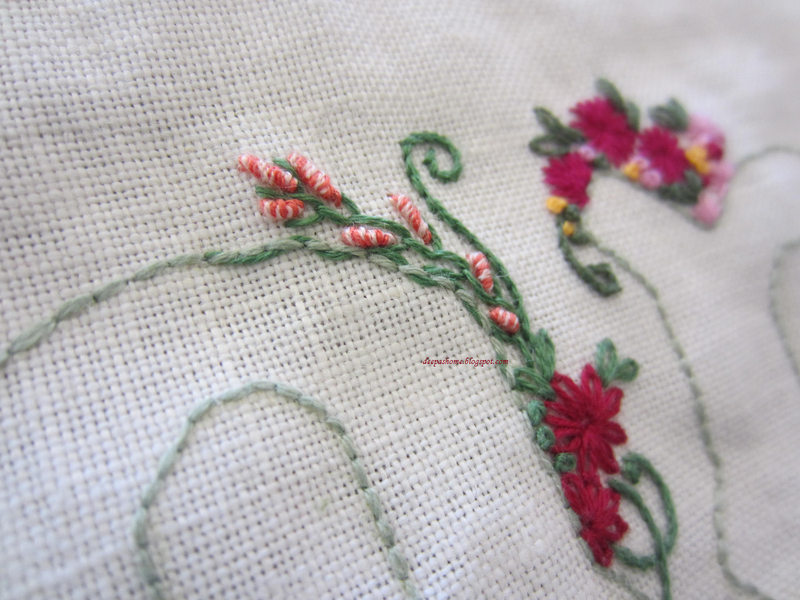 I would suggest a soft green background in a cross-stitch or 1/2 cross-stitch, and hope outlined with a pale dimensional stitch. This way the different elements wouldn't be so apt to fight with one another. Or, one could fill in the letters with the flower sprays and greens and leave the background a plain stitch in an ecru. Just my thoughts. I'm sure whatever you decide, the project will be stunning. Very pretty embroidery, Deepa! I envy you your bouillon stitches, I have not yet learned to do those. I don't have any advice, I think it's coming along beautifully the way you are doing it. It looks pretty already. I'm sure it's going to look fabulous when completed. 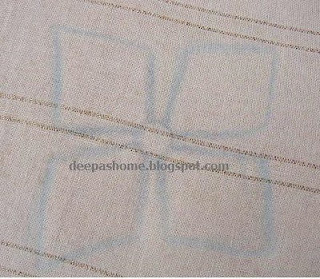 Thank you Deepa for visiting my blog. Glad to meet a fellow Indian blogger. Wow your work is gorgeous. The current piece looks so promosing.